This week we’ve jumped into the text of the Book of Mormon proper with Mosiah chapter 1 in the Community of Christ version, which is chapters 1-3 in the LDS version. Although the dictation process in the initial phase after the loss of the 116 pages was apparently slow and halting, the resulting text was certainly not lacking in ideas and content. Indeed, in this week’s reading we have the first portion of King Benjamin’s sermon — one of the most celebrated components of the Book of Mormon. As a result, this post will run a little longer than my plan for a normal week, but hopefully you’ll find it worthwhile. As we begin our reading, we find ourselves at the end of the life of King Benjamin. We are told by the narrator that “there was no more contention in all the land of Zarahemla among all the people which belonged to king Benjamin, so that king Benjamin had continual peace all the remainder of his days” (Mosiah 1:1 CofC and LDS). As we discussed last week, it’s tempting to speculate that the first part of the Book of Mosiah was lost among the 116 pages (which may well have contained many more lost books than just the lost Book of Lehi). If so, the missing section would presumably have covered a period of warfare prior to this time of peace. This restates the purpose of the text we read in last week’s revelation from the Doctrine and Covenants (D&C 2:6a-e CofC/D&C 3:16-20 LDS) in greater detail but with an important difference. In the D&C revelation the “Lamanites” — for which we should read the Native Americans in Joseph Smith’s day — are to be given a written history that will lead them to “believe the Gospel and rely upon the merits of Jesus Christ.” In King Benjamin’s teaching, the same dilemma (fro is cited: lacking such a written history, Native Americans refuse to believe “even when they are taught”. But unlike in the D&C where the gospel of Jesus Christ is cited, King Benjamin calls this knowledge the commandments and mysteries of God, (for an important reason we’ll see later in the reading). In King Benjamin’s teaching, the appreciation of the power of text expressed here is something that resonates especially for me. Addressing the gathered multitude, King Benjamin first presents himself as a kind of perfect model of sacred kingship — providing a check list for the righteous exercise of authority, both secular and religious. Since these are a list of his own qualities and acts, he is forced to include a slightly defensive humblebrag: yes, humility should be on the list, so you can be sure “I have not done these things that I might boast…I do not desire to boast…” (Mosiah 1:47-48 CofC/2:15-16 LDS). The content of this sermon doesn’t let up. Although we’re skipping a lot — there’s far too much here to cover in one blog post — I want to get to place where King Benjamin fulfills his special promise to reveal a name to his people, which knowledge will make them “distinguished above all people” exiled after the destruction of Jerusalem. “And shall go forth amongst men, working mighty miracles, such as healing the sick, raising the dead, causing the lame to walk, the blind to receive sight, and the deaf to hear, and curing all manner of diseases. And he shall cast out devils, or the evil spirits which dwelleth in the hearts of the children of men. “And lo, he shall suffer temptations and pain of body, hunger, thirst, and fatigue, even more than man can suffer except it be unto death; for behold, blood cometh from every pore, so great shall be his anguish for the wickedness and the abominations of his people. “And he shall be called Jesus Christ the Son of God, the Father of heaven and of earth, the Creator of all things from the beginning; and his mother shall be called Mary. And lo, he cometh unto his own that salvation might come unto the children of men, even through faith on his name. Now I would remind you, brothers and sisters, of the good news (“gospel”) that I proclaimed to you, which you in turn received, in which also you stand, through which also you are being saved, if you hold firmly to the message that I proclaimed to you—unless you have come to believe in vain. As in Paul’s theology, the purpose of Jesus Christ’s ministry in King Benjamin’s gospel is “that salvation might come unto the children of men, even through faith on his name.” This idea is explored in considerable detail elsewhere throughout King Benjamin’s address (and Paul’s letters). One critical distinction that King Benjamin makes is that although those who have knowledge of Christ must repent and have faith in Christ to be saved (Mosiah 1:108 CofC/3:12 LDS), Christ’s atonement automatically covers those who are ignorant of Christ’s gospel (Mosiah 1:107 CofC/3:11 LDS), including especially those who die in childhood (Mosiah 1:114-15/3:16 LDS), meaning damnation in King Benjamin’s conception is reserved only for those who have heard the gospel and reject it (Mosiah 1:127-29 CofC/3:25-27 LDS). King Benjamin’s calls the pre-existent Christ “the Lord Omnipotent who reigneth, which was and is from all eternity to all eternity” and goes on twice to use the formula “Christ the Lord Omnipotent” (Mosiah 1:116,118 CofC/3:17,18 LDS). This strong equation of Christ with the Lord Omnipotent might imply either a Trinitarian outlook, or an even higher Christology — the idea that the pre-existent Christ is God the Father (modalism or Sabellianism). We’ll surely get more hints as we continue. If you’re reading along and other content-related things popped out at you, please feel free to comment! Next week’s reading is Mosiah 2-5 (CofC), 4-8 (LDS), where we’ll hear part 2 of King Benjamin’s sermon. 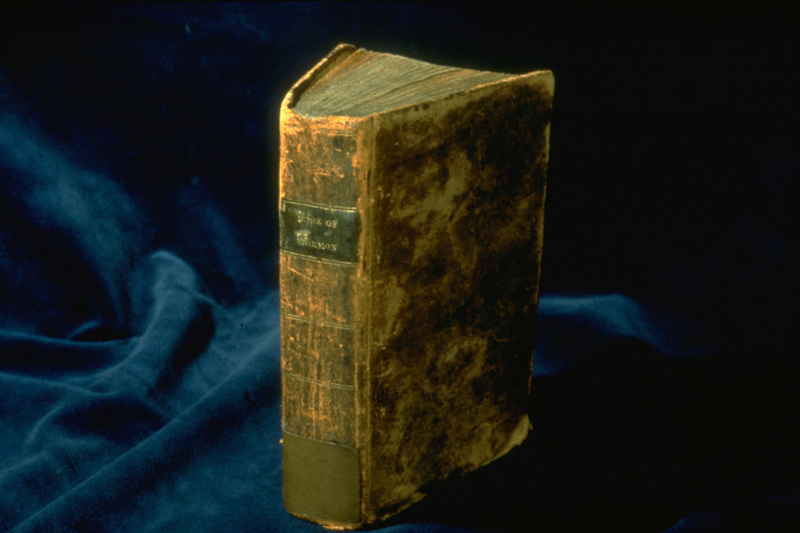 As I noted in the first post outlining the project, the Book of Mormon was only broken up into verses after the schism of 1844. As a result, the LDS Church and Community of Christ have completely different versification systems. Because there’s so much content to consider this reading, I want to temporarily side-step a lengthy discussion of race and the Book of Mormon. We will surely have much more to say in future weeks. For now, I’ll say that to my thinking, the Anglo-American worldview of the early 19th century was itself unarguably racist and the Book of Mormon reflects the historical biases of its day, just as Paul’s epistles reflect the biases of the Roman Empire of the 1st century CE. Since we are not reading the Book of Mormon as a history this year, I am not supposing here that the text has anything at all to do with the actual history and pre-history of peoples indigenous to the Western Hemisphere prior to 1492. Instead, I expect the description of Lamanites in the text will tell us about the ideas (and prejudices) of Joseph Smith and other Anglo-Americans in the US of the early 19th century. According to Biblical stories, the exiles from the fallen kingdoms of Judah and Israel would include those taken to Babylon, those who (like Jeremiah) fled to Egypt, along with the members of the northern kingdom who had previously been removed by the Assyrians. Paul’s writings pre-date the composition of the four full-length gospels of the Biblical canon, and thus the “summary” in his case would be those details about the life of Jesus that Paul thought were most relevant, based on what Paul might have known from the contemporary oral tradition. • Last week in the D&C revelation, we were told “neither doth he [God] vary from that which he hath said” (D&C 2:1c CofC/D&C 3:2 LDS) and in this reading the same teaching is repeated: “he [God] never doth vary from that which he hath said” (Mosiah 1:56 CofC/2:32 LDS). • In explaining why he needed to rehearse his characteristics as ruler to his people, King Benjamin said “I, at this time, have caused that ye should assemble yourselves together, that I might be found blameless and that your blood should not come upon me when I shall stand to be judged of God of the things whereof he hath commanded me concerning you” (Mosiah 1:64/2:28 LDS). Henry’s theology is more sophisticated and he disagrees (the text is here), but King Benjamin’s words imply that he may agree with the men. This is great! I really appreciate all your hard work putting all this together! I noticed 1:64 too. It appears that the only consistently advocated idea about war in the Book of Mormon is that it is sinful. Some of its heroes advocate violence used as the lesser of two evils, some of it reject entirely, but it seems that no one presented as righteous truly believes that the use of violence comes without considerable ‘staining’. Thanks for the Henry V tie-in. A very helpful comparison. Additionally, I found the descriptions of political power and the ideal nature of community interesting. Benjamin clearly believes that God installs rulers over people, and that he is one of them. While I reject this idea, it is possibly helpful to perceive his statements as a reflection of the king God would give his assent to. In this kingdom, not only should his relationship to the people be one of humility, but he clearly believes that selfless service is the characteristic of a godly community. Those in power should work with their hands – physically contribute to the life of the community. They should not seek wealth. They should not use their power to take way others’ liberties (1:44), i.e. the agency of each person to use their power for their own service or the service of others is too important for him to interfere with – even while considering it the natural condition of man to be ‘evil’, which, we can assume by his description of virtuous life, is characterised by selfishness, among other things. It’s my impression on re-reading that Benjamin is not an ideal ruler (such a human has never existed), but he has a decent idea of what one should look like. Like us, he is aware of the ideals, and has lived a life that struggles to accomplish them. Ugh! Sorry for the weird comment! I stopped my thought started it again. I must proof read my comments better – especially seeing as this isn’t facebook and I can’t edit them! Great thoughts, Rick! I like your point on war. Given how much warfare we’ll be treated to in the narrative, I think we’ll have a lot of opportunity to consider the range and nuance or lack thereof of theology of the Book of Mormon. Regarding divine rulership: It’s kind of an interesting mix. Benjamin is the king, but he’s also a religious leader. He has inherited his leadership via lineage from his father and he is passing it on to his son, yet in justifying his rule, he insists “I have been chosen by this people” (Mosiah 1:42 CofC). So, somehow there is a popular mandate, lineal inheritance, and divine rite. It reminds me a little of the old RLDS practice of our prophetic monarchy. The prophet-president was called by God, and nevertheless he was chosen to inherit by his father (or brother), and nevertheless the position was technically dependent on the common consent or election of the General Conference of the church, representing the people. I agree that the verse you and I both quoted against leader worship (Mosiah 1:40-41 CofC) is important enough to quote twice. I no longer attend church (the Utah LDS one) and pretty much think that JS et al were frauds (although sometimes I still think there may be some wiggle room in that by some incredible, logic defying way, they weren’t). Having said this, though, I have always liked reading the BofM and I suppose you could say, “I felt the ‘spirit’ when reading it.” It was the principal LDS scripture that I would read and study, and the Book of Mosiah with King Benjamin was my favorite read. In fact I even named one of my sons Benjamin. Anyway, reading this particular blog entry is very reminiscent of those days. I have never felt that I could ever reject Christ, and I came to this realization more than ever while studying Buddhism and attending sanga meetings. It seems to me, though, that according to JS, as stated in the Doctrine and Covenants, I will still be ‘somewhat’ damned (to the Terrestrial Kingdom) because I didn’t remain ‘valiant in my testimony’ by leaving the ‘Mormon’ church (JS’s church, but which one?!). My thoughts on ‘Christology’ (and I very much liked all of your explications) is that Christ is subordinate to the ‘Father’, but the most Supreme to us in that we are to follow His path to the ‘Father’ who is not an anthropomorphic being, but the total essence (for the lack of a better term) of all creation. He, the ‘Father’ is so beyond us having lived from everlasting to everlasting as to be almost inconceivable and is referred to as ‘Father’ by the Christ chiefly out of reverential respect. In fact ‘He’ in all likelihood is not a ‘He’ nor a ‘She’ and certainly not an ‘It’ but perhaps more like a ‘He-She’ — one singular, most holy, Devine being of essence who exists beyond space and time and all dimensions, however many there may be that are totally beyond our comprehension. When I contemplate Christianity and especially on a cosmological scale I think ‘Christianity’ through Christ is just barely a scratch in the surface of what there is to come in the eternities. And to make the most ‘headway’ (again, for lack of a better term) in those eternal realms, we need to be like Christ (His Gospel) and people such as King Benjamin. Just my thoughts. Thanks for posting. Thanks for sharing your thoughts, Paul. I really like your Christology, which is very consonant with my own — in my book, we’re in communion together. Regarding Joseph Smith’s vision of the three degrees, with all conceptual speculation of both afterlife and future apocalypse in scripture, I prefer to re-interpret the vision so that is meaningful in life as we’re living it. E.g., with Jesus’s conception of the Kingdom of God, it’s not something I want to wait around for, looking to the sky for it to literally descend like Joseph Smith’s city of Enoch. Rather, it is something we experience (or strive to experience) here and now in communities we build when we work to live examined, meaningful lives together. Thus, to my thinking, you are living a Celestial existence by thoughtfully exploring Buddhism and unpacking and repacking your ideas about God, the universe, and existence. A Terrestrial existence in this metaphor might be memorizing rote “answers” and picturing the world through a tradition handed to you, without thinking seriously (critically) about it. I’d leave the Telestial to those leaders who are actively engaged in deception, for example by encouraging fellow humans to believe that they (the leaders) exist on a higher spiritual plane when they themselves know better. As you well know, Joseph Smith said something to the effect that the nearer we get to God the more we are disposed to look with compassion on perishing souls. Hence, how am I feel towards ‘leaders’ (the Utah LDS church ones) when they have earnestly strived to ensnared me with guilt if I don’t follow exactly what they dictate (and I believe ‘dictate’ is the proper term)? Is it indeed incumbent upon me to feel compassion for these men when I still possess some residual guilt or fear in the deep recesses of my soul because of their systematic brain and fear mongering techniques (and they must realize they do this)? It’s a quandary, I would say. Nevertheless, I thank you for your comforting reply. P.S. I still think of those days attending the LDS chapel on Ossington Avenue and wonder what it’s like and where all of those people are today. It seems like it was another life-time long ago.